Just because the leaves are turning and patios are closing up doesn’t mean you have an excuse to stay at home. There are still plenty of DC area bars that offer a lot of entertainment to help you ride out the winter. So order up a hot toddy or three, send out the group text, and get down with everything from Skee-Ball to Street Fighter to ping-pong to giant Jenga. 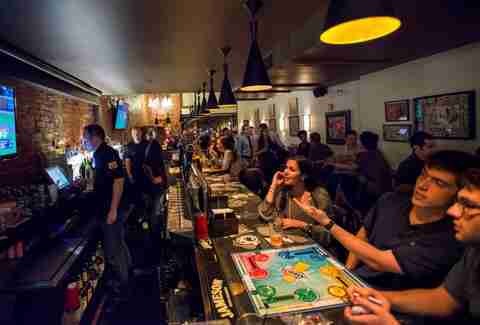 Serving over 60 beers (with eight on tap), plus five pool tables, two shuffleboard tables, and a couple of dart boards, this Cleveland Park staple is no frills and all fun. Dark, unassuming, and regularly packed with regulars, it’s a place you can easily lose track of time -- which can rack up your billiards bill. 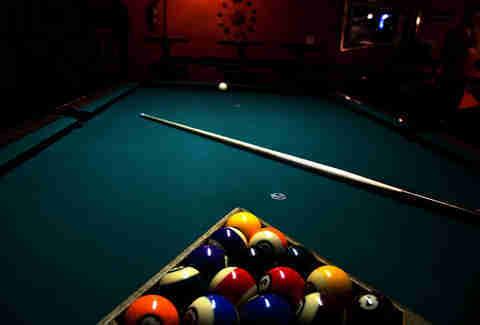 If shooting pool isn’t your speed, try your hand at Connect 4, Uno, or Big Buck Safari; Atomic Billiards has something for everyone. Comet Ping Pong’s vibe can be summed up neatly as ping-pong, pizza, and punk shows -- this restaurant has been upending expectations for a decade now. Serving some of the DMV area’s best thin-crust pizzas, this restaurant doubles as a ping-pong parlor, and triples as a concert venue. All ping-pong tables are free, which makes them an excellent way to kill time while you wait for a table or for a show to start. But don’t be fooled by the chill settings -- Comet Ping Pong can get pretty rowdy, as they regularly book some of the more compelling indie music acts touring the country; past performers include Speedy Ortiz, Prince Rama, and Ty Segall. Totally worth a trip up to Chevy Chase. While each of these bars is distinct in its own right, H Street Country Club takes it up a notch. This multi-story bar is the only one on our list to feature both a roof deck and an indoor, nine-hole mini golf course inspired by the District -- a winning combination in our book. 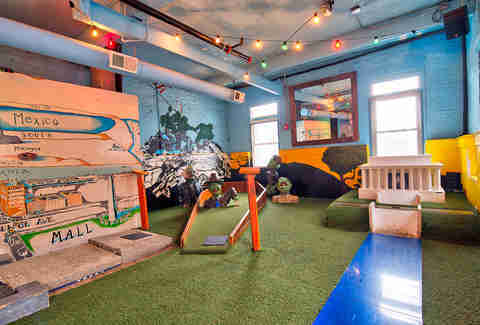 It’s not the fanciest putt-putt course, nor is it in the best condition, but it’s functional, fun, and fully indoors. They’ve also got giant Jenga, shuffleboard, and a Skee-Ball league you can join. If you’d rather just get your drink on, make the most of HSCC’s full bars on each floor -- meaning you can easily move around and escape crowds and long waits for drinks or food. 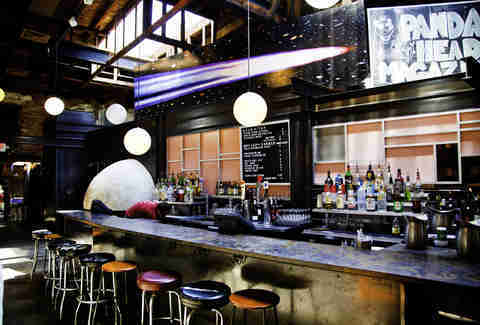 Another low-key bar that serves as a neighborhood oasis, Breadsoda might be half a block down the street from the frat-tastic Mason Inn and Town Hall, but it is a world away, vibe-wise. This '70s-style billiards bar has a couple of pool tables, shuffleboard, and about 12 different free board/card games to choose from. 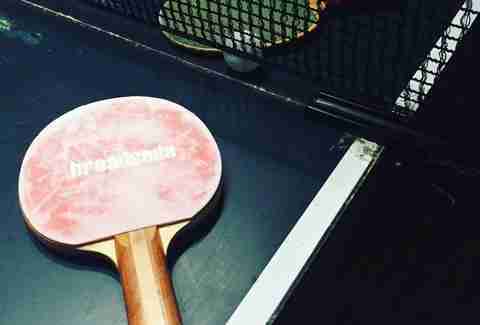 As an added bonus, they bring out the ping-pong tables on Tuesday nights, serving up fierce competition from 5pm until close. The food is actually pretty good, with upscale versions of typical bar fare -- try their Moroccan Chicken Salad sandwich on a croissant. 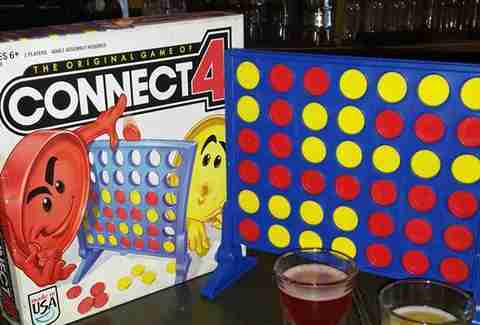 Red Derby is a great neighborhood bar that happens to have some board games. If you’re looking for a night of serious activities, then maybe head to one of the other spots on this list, but if you want to have a wonderful time at a cheap, relaxed bar, then this is your place. The staff is friendly and welcoming, and the food is pretty delicious -- we love their veggie burger and sweet potato fries. It’s an unpretentious, low-key spot on 14th St that shares a block with a few other hole-in-the-wall gems, such as Lyman’s Tavern, and Taqueria Habanero (featured on our Best Authentic Latin Restaurants guide). Red Derby is cheap, but make sure to bring cash -- they don’t accept credit cards, and the ATM downstairs charges a fee. With a well-heated, covered, and warmly lit rooftop bar, you’ll be able to take in some fresh air throughout the winter without ever being unduly uncomfortable. Can you tell we’re fans of this place? Atlas Arcade is unique on this list in that it might be the only bar that actually features video games in the classic sense, as opposed to board/parlor games. 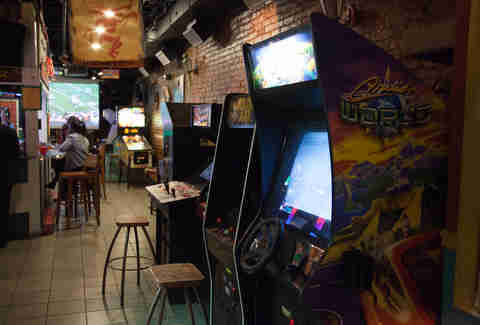 Ideal for children of the '80s, this H Street corridor oasis has plenty by way of classic arcade machines, including Street Fighter II, Big Buck World, Cruis’n Exotica, and Teenage Mutant Ninja Turtles. It doesn’t hurt that the games are pretty affordable ($0.50/game), as are the primarily canned selection of beers -- it is H Street, after all. As an added bonus, you can play console games spanning the NES, SNES, SEGA Genesis, and N64. Pro tip: Test your skills in a four-player game of GoldenEye 007 using only throwing knives. It won’t be pretty... but it will be a hell of a good time. 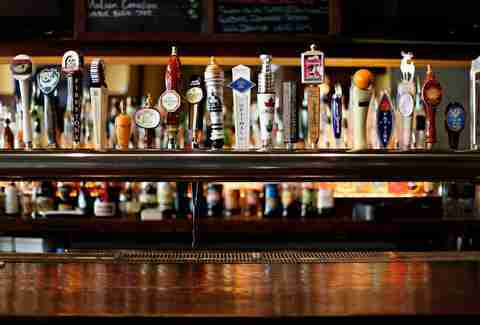 If you’re a beer lover, this is probably the bar you want to check out on this list. The Iron Horse Tap Room prides itself on its varied selection of draft beers, constantly working to source and feature local brews as well as rarities from around the country. 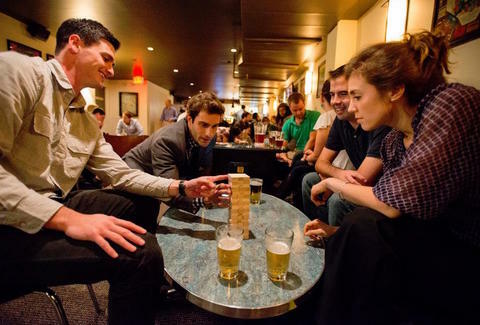 While it can get crowded due to its proximity to the Verizon Center, if you’re lucky enough to be here on off-nights, it’s a real treat, offering up shuffleboard and Skee-Ball -- not to mention some of the best late-night happy hour specials in town ($4 Fat Tire drafts!). 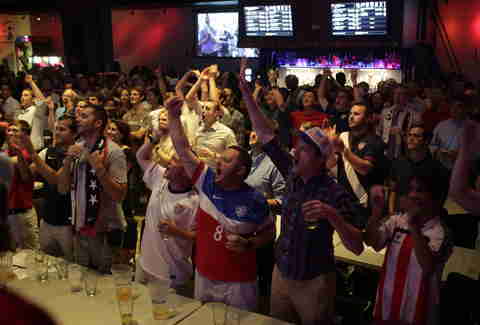 This Arlington mainstay is a popular happy hour and college football destination that has enough going on during regular hours to always attract a solid clientele -- including a hidden beer garden out back, as well as plenty by way of bar games. With pool tables, Skee-Ball, shuffleboard, Pop-A-Shot, and the Power Punch game that always breaks our hands, Spider Kelly’s is a laid-back place to get a drink and blow off some steam. Penn Social is basically an adult Chuck E. Cheese’s -- this cavernous, two-story sports bar bombards you with light, sounds, and movement from every direction and angle. You can definitely scratch your gaming itch here: they have board games, shuffleboard, Skee-Ball, foosball, Pop-A-Shot, giant Jenga, and a giant Connect 4 -- basically, there’s no shortage of ways to (not-so) quietly assert your dominance over your friends and coworkers. While the food is “meh” and there’s occasionally a cover charge on weekends, the drinks are stiff enough and competitively priced -- for Penn Quarter -- to keep you loose and the bar in booming business. Jose Lopez-Sanchez is a writer, comic, and one-time giant Jenga champion. He is a native of the Dominican Republic.